Yesterday I presented my readers with the story of Vishy Anand the Chess grandmaster from India who made us proud in the international arena. From a sedentary sport like chess, today I will move over to a sport that requires phenomenal athletic ability, skill and stamina. This is none other than tennis in which we Indians have produced some great stars like Leander Paes, Mahesh Bhupathi and Vijay Amritraj. But the player whose story I am going to present today is my personal favourite, Bjorn Borg. Many of today's generation might probably ask Bjorn who? Borg used to play tennis when I was a school kid which is nearly thirty-nine years back. So I don't think there are chances that too many of my readers have heard of him. Bjorn Rune Borg was born on 6 June 1956 in Stockholm. He was the only child of Rune and Margarethe Borg. Borg's father won a Golden tennis racket at a table-tennis tournament which he handed over to Borg. Thus began his tennis career. The rest is history. By the time Borg was thirteen he was proving himself capable of beating the best of Sweden's under-eighteen tennis stars. Borg debuted internationally in the 1972-73 season when he played in Sweden's Davis Cup team. He was just fifteen at that time. In the same year, he won the junior Wimbledon. Borg's first top-level singles title was the Italian Open when he was eighteen. He defeated none other than Ilie Nastase who was a great champion. Borg then went on to become the youngest ever French Open champion in 1974. Borg was essentially a baseline player. Many players in the modern era feel that the serve and volley technique is a better tactic to use, but Borg preferred to stay at the baseline after serving. Another characteristic of Borg's game was his psychological toughness. He was one of those players who would never allow the conditions on the tennis court to get to his nerves. He would never argue with the umpire and would remain calm and collected no matter what the circumstances. He retained the French Open in 1974 and his first Grass Court success came at Wimbledon in 1976. At this point in time, Borg was the youngest ever to win Wimbledon at twenty. That was when his rival Ilie Nastase famously said, 'We're all playing tennis. But he's [Borg] playing something else.' But in 1975 Borg could not retain the French Open. Borg reached the semi-finals of the US open in 1976 but lost to Jimmy Connors in the final in a five-set thriller. In 1977 Borg again faced Connors in the Wimbledon final, but this time he got the better of Connors and for the first time was ranked World No 1. Through the years 1978 to 1980 Borg was in superlative form. In the year 1978 Borg won both the French Open and Wimbledon. The year 1978 was a very important one in Borg's career because that was the year he played his arch nemesis and rival John Mcenroe for the first time in a semi-final at Stockholm and lost. This was just an indication of things to come in the later years. In 1979, Borg again won both the Fench Open and Wimbledon. The fact that Borg was uniformly able to perform well in the French Open which is played on a clay court, as well as Wimbledon which is played on grass, showed his true greatness and versatility as a tennis player. Tennis players are usually either clay court players or specialists on grass courts. Borg was phenomenal because he could excel in both. 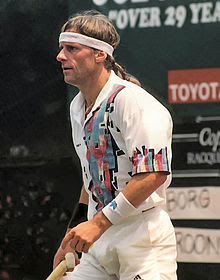 Borg won the French Open in 1980 and this time he came up against John Mcenroe in the Wimbledon final. I remember watching that match on TV myself and believe me, both the players were simply class personified. This five-set thriller is often cited as the greatest Wimbledon final ever played. Mcenroe came out with all guns firing and it took all of Borg's phenomenal ability to ward off Mcenroe's challenge. Borg won his last grand slam title in 1981 when he won the French open but at Wimbledon, a determined Mcenroe put an end to Borg's never-ending reign of supremacy in four straight sets. Borg did not do well in matches after that and eventually retired. He attempted a comeback in 1991-93 but was a dismal failure. When he retired, Borg was a rich man with three residences, a penthouse in Monte Carlo, a mansion on Long Island, New York and a small island off the Swedish coast. He was also the owner of a fashion label which became famous in Sweden. Borg married the Romanian tennis player Mariana Simionescu and later divorced her. He fathered a child with the Swedish model Jannike Bjorling and for some time was married to the Italian singer Loredana Berte. In 2002 he married for the third time. His new wife was Patricia Ostfeld. Together they have a son Leo. Many of Borg's ventures failed and he avoided bankruptcy narrowly. Borg has several achievements to his name. He was the BBC Overseas Sports Personality of the Year in 1979. In 1987 he was inducted into the International Tennis Hall Of Fame. In the year 2006, BBC awarded Borg a Lifetime Achievement Award which was presented by Boris Becker. In 2014 Bjorn Borg was elected Sweden's top sportsperson of all time by the newspaper Dagens Nyheter. I hope you enjoyed reading about this Tennis maestro from Sweden. Tomorrow I will present the story of yet another sporting great. I had assumed it would be Borris Becker today. But so happy to see Borg instead. Like I said yesterday, I am here to learn and pass it on to my little one and your research and narrative is really gripping. Thanks Sonia. I did think of Boris Becker who is indeed another one of my favourites and in fact makes a better subject to write on with all the controversies surrounding him, but I chose Borg because I admired his game and was my favourite when I was in grade school. Further I thought I would also write about players whom most people may have forgotten about or not heard of. Yes, he is a Swede and was a really swashbuckling player. Post retirement he became wayward and lost his money and generally slipped into oblivion. Suhasini, even Sonia mentioned that. I guess all of you are much younger than I am and are more familiar with Boris Becker. But I have watched both players play for a long time and I feel Borg is a far superior player. But then again not many people in the contemporary era have heard of Borg, leave alone watch him play. Thanks for visiting. So glad am reading such an informative theme. Keep them coming. Glad you are enjoying it. Keep visiting. Good to read about Bjorn Borg. I didn't know anything about him and I must confess that I am not a sports buff. Thanks for sharing. Glad you visited and enjoyed reading the post. Thanks for sharing. I didnt know about the legendary star. Also I am sure to brush my sports facts by going through your posts. Yes, Shubra, Not many people have heard of him nowadays. He played during the seventies and was a favourite of many. He is considered one of the all time greats. Hope to bring more posts that bring sports persons of an earlier period to people's notice. He was a very famous player of the seventies and is considered one of the all time greats. But since he played in the seventies not many people have heard of him. Thanks for visiting. My bad that I didn't know about him. Thanks for sharing these details Jai. So many marriages and a lot of money, I must say! Thought I would add some interesting tidbits by mentioning his personal life too. He was a great player though. Thanks for visiting. Happy you are liking the posts. Hope to bring you the stories of more sporting greats. Thanks for visiting. Thank you Trapti. I am happy you enjoyed reading the post. I remember watching Steffi Graf, Andre Agassi etc in Wimbledon matches when I was younger. Bjorn Borg was famous but wasn't playing so much by then. The famous match with John McEnroe is the stuff that goes into history and stays there. Looking at his personal life though, seems like all his success was limited to the court, clay and grass, both. I guess he was not a disciplined person in his personal life. But on court he was a phenomenon. Thanks for visiting.